Napier had to have created this stunning flask for he who has everything!! 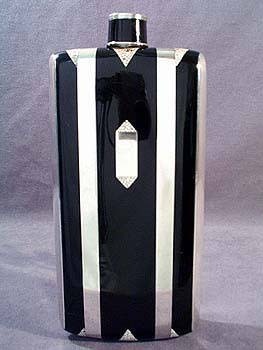 Elegant Art Deco styling of rich glossy black enamel applied over sterling silver create this incredibly beautiful flask. the top of the neck is marked "Napier - Sterling - 26 oz.". The cap extends into 4 sections and forms a 2-1/2" tall sterling and enamel "shot glass". Nearly 10" tall and 4-1/2" wide, this magnificent flask weighs 25 ounces, and holds 26 ounces of your favorite beverage. The front is in great shape, showing only minor wear marks, with somewhat more significant wear and scuffing on the back. There is some enamel peeled at the base of the neck, and some minor chips and dings on the cap. None of these can deter from the magnificence of this piece. This sophisticated flask does show use, but obviously was very well cared for, and still retains all of its beauty and elegance.